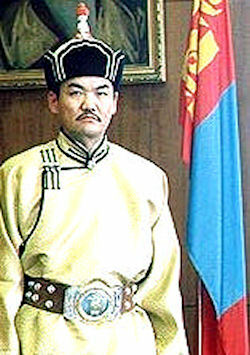 Natsagiin Bagabandi served as the president of Mongolia from 20 June 1997 to 24 June 2005. Natsagiin Bagabandi was born in 1950 to a herdsman's family living in Yaruu Somon, Dzabhan Aymag. He completed his schooling in 1968 at the Uliastay City 10-Year Secondary School, in 1972 the Leningrad City Technical School for Refrigeration, in 1980 the Odessa City Institute for Refrigeration Technology, and in 1987 the Social Sciences Academy subordinate to the Central Committee of the CPSU. Bagabandi qualified as engineer-technologist and acquired the degree of candidate of philosophical sciences. Bagabandi worked from 1972 to 1975 as a repairman, mechanic and engineer at the Ulaanbaatar City Vodka and Beer Combine, as head of the ideology department of the Tob Aymag Mongolian People's Revolutionary Party (MPRP) Committee, and as of 1987 as lecturer-propagandist, section head and department consultant at the Central Committee of the MPRP. Bagabandi was elected member of the Central Comittee of the MPRP by the Extraordinary Congress of the MPRP; elected member of the Presidium of the Central Committee of the MPRP and secretary of the Central Committee of the Party by the Fifth Plenum of the CentralCommittee; re-elected secretary of the Central Committee of the MPRP and member of the Presidium of theCentral Committee of the MPRP by the First Plenum of the Party Central Committee elected by the 20th MPRP Congress (02 March 1991). In the presidential election on 18 May 1997, the 1993 presidential election results were overturned, and Natsagiin Bagabandi, the MPRP candidate, won the presidency. With 60.8% of the vote, Bagabandi won against two other candidates: the incumbent of seven years, President Ochirbat, from the Democratic Union coalition, which retained its majority in the Great Hural from the 1996 elections; and Gombojav, from the MongolianUnity Party (MUP). Thus the government was divided between the executive and the parliament. Analysts regarded Bagabandi’s election as an expression of public frustration over the drastic and painful economic reforms imposed by the government after the 1996 elections. Mongolian President Bagabandi visited Moscow in 1999, and Russian President Vladimir Putin visited Mongolia in 2000 in order to sign the 25-point Ulaanbaatar Declaration, reaffirming Mongol-Russian friendship and cooperation onnumerous economic and political issues. President Hu Jintao visited Mongolia in 2003 (his first international visit as China's President), and President Bagabandi visited China in 2004. Deputy Secretary of State Richard L. Armitage visited Mongolia in January 2004, andPresident Bagabandi came to Washington for a meeting with President George W. Bush in July 2004. President Bush, Mrs. Bush, and Secretary of State Condoleezza Rice visited Mongolia in November 2005, after Bagabandi had left office.